Our bedroom is pretty small, like 12 x 12 small, so I thought we might free up some space by replacing our nightstands with wall mounted shelves. We could have purchased ready made shelves or a piece of plywood, but where's the fun in that? 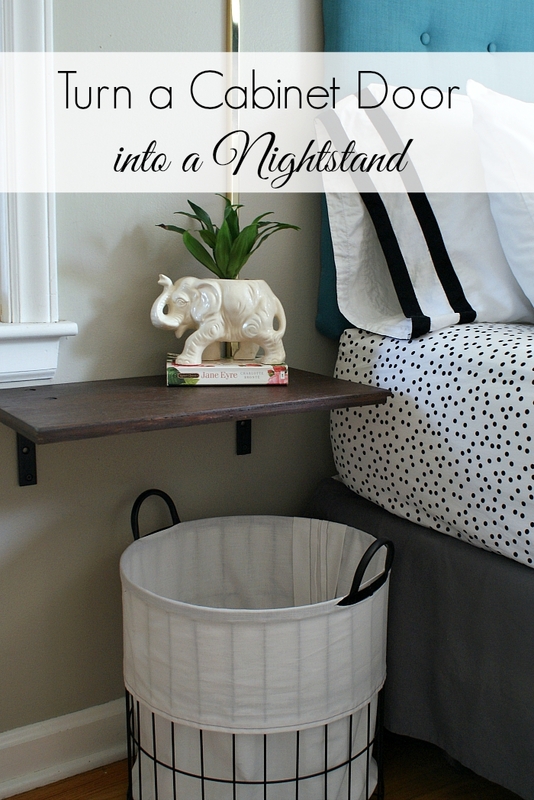 Instead, I bought a pair of old cabinet doors from the ReStore and up-cycled them into floating nightstands, which was less expensive and way more fun! 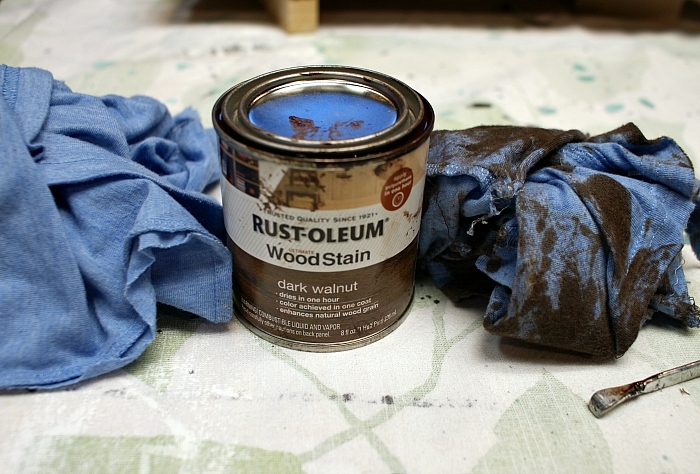 First, I removed the existing stain using our orbital sander and 60 grit sandpaper, followed by 120 grit for a smooth finish. Next, Jesse helped me fill in the old hardware holes. To do this, we made the holes slightly larger with a drill bit and then hammered in a piece of dowel with a blob of apoxy. Once it was the apoxy was dry, Jesse used a flush cut saw to smooth it out. Next, he used a f orstner drill bit to make holes for the carriage bolts (similar to the bathtub tray). I sanded the doors one more time with 120 grit sandpaper and removed all the dust by wiping them them with a slightly dampened cloth. 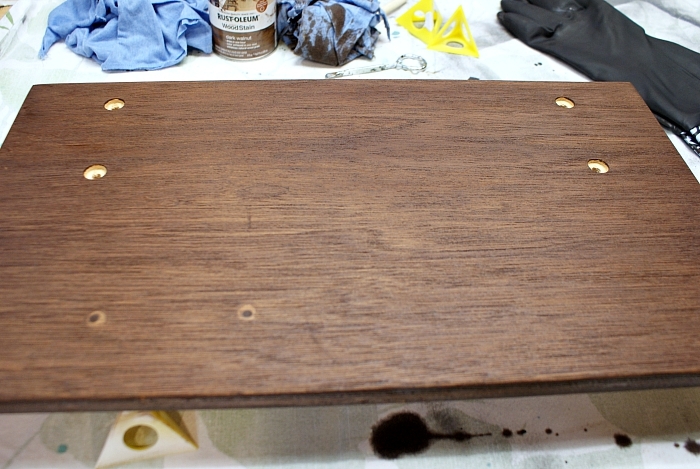 Then, I applied two coats of dark walnut stain (the same can we used for the bathtub tray) followed by a clear coat of polyacrylic spray twenty four hours later. 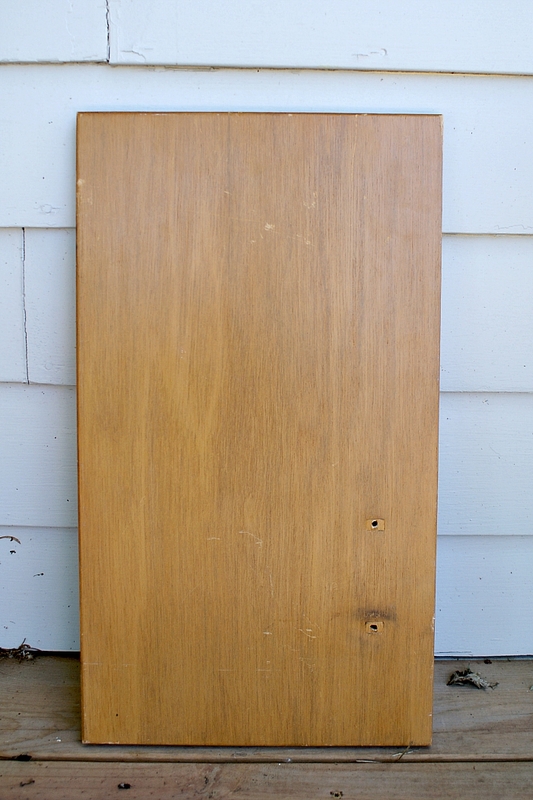 Here's how the doors looked after staining. Note! I should have stained the inside of the holes, too because otherwise a teeny bit of plain wood would show around the bolt heads. By the time I figured that out, I had already poly'd the doors so I filled in the holes with a wood stain pen, which worked fine. Once everything was dry, we added "L" brackets to the underside of the doors, then used screws and drywall anchors to secure it to the wall. The brackets weren't totally straight, so we used a couple of washers as shims between the wall and bracket to make the shelf straight and stable. 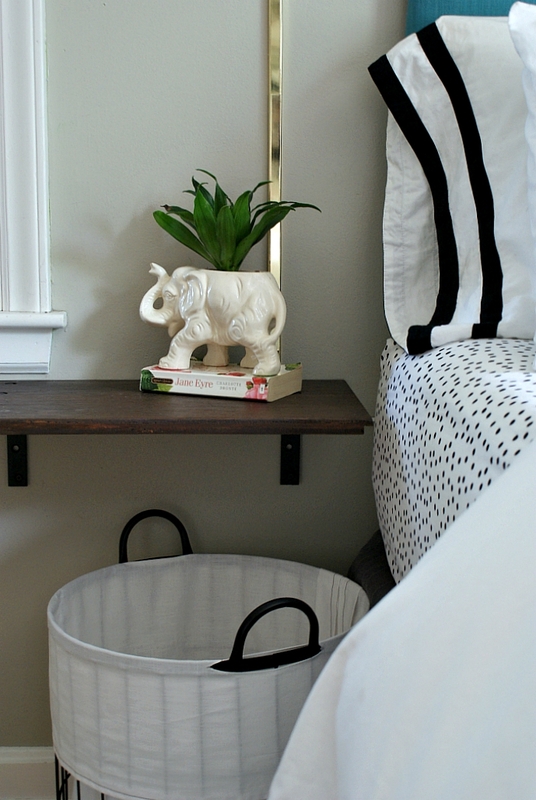 I'm so diggin' how these floating nightstands turned out! I love how they free up space on either side of our bed both physically and visually, plus they're really pretty. 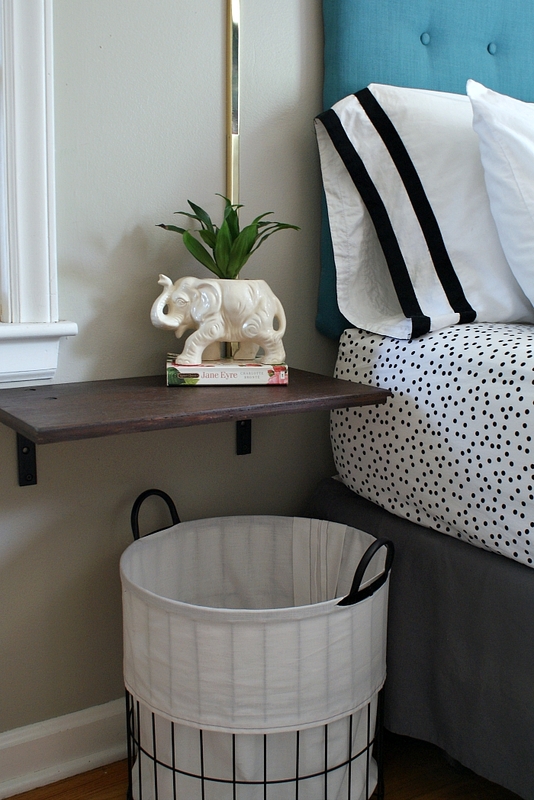 Adding these shelves was the last step in our bedroom spruce up and I can't wait to share the rest of the room later this week! Do you think your method would work to install shelves at higher levels in my craft room? Unfortunately, I have a concrete firewall 1/4th inch behind the drywall. Drilling seems almost impossible. so simple, yet so good. 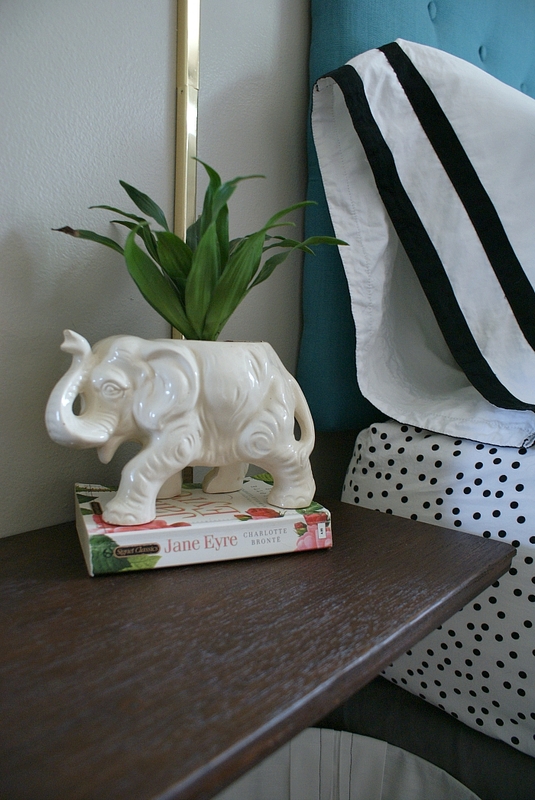 and i'm loving that elephant planter, too. enjoy! Haha, I thought you might appreciate that, Megan! You know I'll keep my thrifty eyes peeled for you!